Sun City Palm Desert boasts three clubhouses and two golf courses in beautiful Palm Desert, California. Palm Desert is located in Southern California, in the heart of the Coachella Valley. The area features a hot climate, which includes some of the warmest winter weather in the country, and an average of 348 days of sunshine each year. High daytime temperatures during the winter months are generally in the low 70s, but they have been known to reach the mid- to high 90s. Summers are very hot, with daytime temperatures well over 100 degrees and nights that often stay in the low 80s. Because Palm Desert has such warm winters and hot summers, it has become a prime destination for snowbirds. Many retirees flock to Palm Desert to enjoy the sunny winters, but go back to other homes during the heat of summer. Palm Desert, and the larger Palm Springs area, typically sees an influx of vacationers during the winter months as well. Whether you are visiting or relocating, Palm Desert offers plenty of recreations to meet the interests of nearly any active adult. Golf is certainly a highlight of the area. 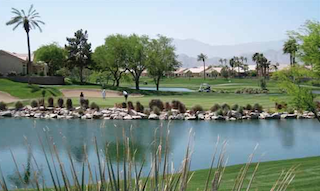 There are over 100 challenging courses spread throughout the Coachella Valley, including the acclaimed Desert Willow Golf Resort in Palm Desert. Active adult golfers who want to settle in the area can also choose a home in a beautiful golf community, such as Sun City Palm Desert. Palm Desert caters to many different tastes with diverse shopping centers and eateries ranging from casual eateries to fine restaurants. Browse the upscale boutiques and galleries in the El Paseo shopping district or find an eclectic mix of shops at the Westfield Palm Desert shopping mall. The area also features a number of day spas where visitors and locals can enjoy a wide range of rejuvenating treatments. World-class arts and entertainment centers also abound in Palm Desert. Dozens of art galleries feature paintings and sculpture, while public art installations spread culture throughout the area. The McCallum Theatre for the Performing Arts, also provides the perfect venue for music, drama, dance and other live entertainment. You can even try your luck at one of the area's many resort casinos. Additional Palm Desert attractions are appealing for visitors of all ages. Visiting grandkids are sure to love a trip to the Living Desert Zoo and Gardens, and everyone will be impressed by a ride on the Palms Spring Aerial Tramway, which rises to the Mountain Station 8,516 feet above. If you've always dreamed of a Palm Springs getaway or a retirement in Southern California, you're sure to love a trip to Palm Desert.